Tile floors in a busy building can be a difficult surface to maintain. Luckily, with professional retail cleaning you can keep your floors sparkling all the time. 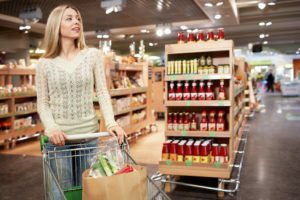 Retail stores come in all shapes and sizes, from small boutique shops to large department stores and each store has its own guidelines on cleaning. Jani-King commercial cleaning is known for their outstanding customer support and their customized cleaning schedules. If you choose to hire Jani-King as your professional retail cleaning company the local branch will work out a personalized cleaning schedule for your store and you can decide how often your building needs to be cleaned and what should be done while the cleaning crew is at the store. Shoppers in your establishment will be more inclined to buy your products when they lift them off of beautifully cleaned shelves and racks. Dusty or otherwise dirty displays are going to dissuade customers from purchasing those products which are on display. Flooring is often the main concern when it comes to retail cleaning. Floors are the biggest shelf in the store and trash, debris, and dirt often find a home on this shelf. As a professional retail cleaning company, Jani-King will make sure that your floors are swept, mopped, and waxed. Your store may have a high amount of foot traffic and need sweeping, mopping, and waxing daily, or your store may be a boutique shop that only needs sweeping daily and waxing once weekly. That’s the beauty of Jani-King; you get to set the schedule for cleaning, whatever works best in your situation is what Jani-King is going to do. Get your store into tip top shape. Have your guests telling their friends about the beauty of your establishment. Give the king of clean a call today. Jani-King representatives are standing by to take your calls and work out a personalized cleaning schedule just for your store.